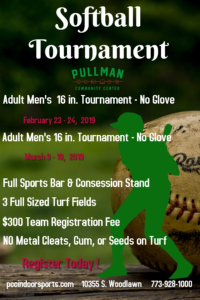 Welcome to the Pullman Center 16 inch softball tournament being held the weekend of February 23-24 . Please click the link below to register your team for the event. Every participant must complete the online waiver process. Payments can be made online with a credit card or cash payments can be made at the Pullman Community Center prior to the start of the event. This event will be an 8 team event. Keep in mind the event is first come first serve. If you have any questions please contact the Pullman Community Center.